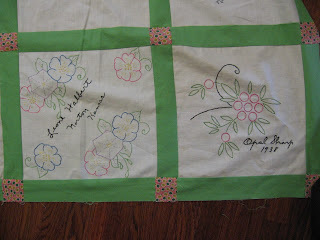 Inder Loves Folk Art: How do you quilt embroidered squares? I've finally finished the quilt top and back for my friend Kristi's wedding quilt, which is made from old depression era "friendship" squares that she found at a flea market and gave to me. 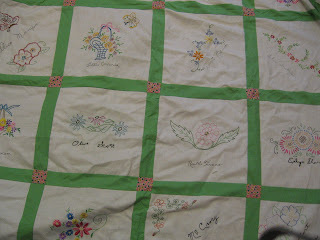 Each square is embroidered with flowers and the name of the embroiderer. One of them says "Norton, Kansas" and another says "1938." All of the ladies had great names, like Flora, Norma, Ida, Doris, Lula, etc. (The quilt can double as a folksy girl baby-names guide.) The finished top looks lovely, if I may say so myself (since most of it is not my labor, I think I can say so). The back is assembled from random scraps I had laying around, like the ladies likely would have done back during the depression. Sorry for the weird photo here - the back is absolutely enormous. But here's the problem. How do you quilt embroidered squares? I can't/don't want to quilt over the actual embroidery, but the squares are much to large to go without any stitching (plus, I like dense, old-fashioned, quilting). Any ideas? I was thinking of cross-hatching around the designs, or, potentially, under and through them. Another, completely unrelated question - how am I going to baste this enormous quilt without the dogs running all over it and messing me up? The dogs seem to think that whatever project I'm working on is their new dog bed, and give me appreciative looks while making a nest out of heaps of batting. 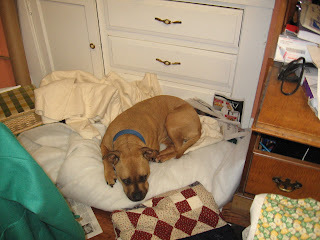 (Note: I mistakenly dumped an entire box of quilting pins into this batting, so Omie is quite the yogi doggie). 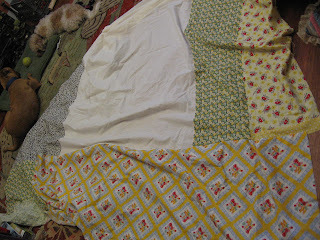 A final aside: I will be lucky if I finish this "wedding quilt" by Kristi's tenth wedding anniversary.